I am just back from a trip to the island of Sulawesi and several small satellite islands, where I saw 13 owls species, which I will introduce in this post using loose taxonomic order, so we start again with the “barn owl” family (Tytonidae). The Sulawesi Masked Owl was the first of the endemic Tyto owls I saw. It is found more or less throughout the island (this photo from central Sulawesi) and on some smaller islands (I will do a separate post of one of the island subspecies that I found interesting). This is a large and dark Tyto owl (can reach 51 cm) with powerful talons. You can see in this photo that the hints of gold in the plumage are rather limited and the central crown is grey despite a golden wash on the neck sides. Very little is known about this species, even basic information on its diet and nesting is rather lacking. 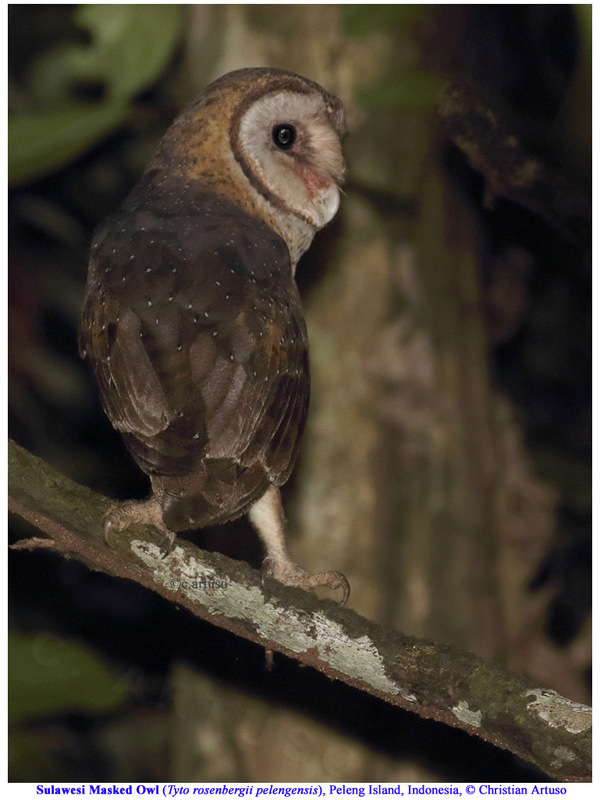 Like so many Tyto species, the Sulawesi Masked Owl has some affinity with caves and one of the few known nesting records was in a sea cave near Tangkoko (others in tree cavities). This species occupies a wide variety of habitat types, from forests to rural areas and even grassland interspersed with trees but is less of a true forest owl than the Minahassa Masked Owl (below). The individual in the photo below was seen in rather open wooded area near the village of Sedoa in central Sulawesi at approximately 1250 m ASL. Sulawesi Masked-Owl (Tyto r. rosenbergii), central Sulawesi, Indonesia, © Christian Artuso. The pelengensis race of the Sulawesi Masked Owl, from the islands of Banggai and Peleng, is very poorly known and seldom seen. It was an extraordinary privilege to see one by night and one by day with the help of Alpian Maleso. It appears MUCH smaller than the nominate race of Sulawesi Masked Owl, which took me so much by surprise that I thought I was looking at a Minahassa Masked Owl for a second (but a few features such as the less dense feathering on the lower tarsi tipped me off, not to mention the fact that Minahassa Masked Owl is not supposed to occur on these islands). Given that there is an endemic Tyto on the island of Taliabu, the Taliabu Masked Owl (which was the one owl species on that trip that I saw but did not manage to photograph), and that there are some commonalities between Peleng/Banggai and Taliabu (Sula Islands), this taxon deserves more detailed study. Sulawesi Masked-Owl (Tyto rosenbergii pelengensis), Peleng Island, Indonesia, © Christian Artuso. Rare, poorly known, a deep forest (rainforest) species that is range restricted, bring confined to the northern peninsula of Sulawesi, known as the Minahas Peninsula, plus a small portion of the central region around Lore Lindu National Park, the Minahassa Masked Owl is listed as globally Vulnerable to extinction. It is similar in appearance to the Sulawesi Masked Owl but much smaller in size with a rounder and smaller facial disk with a pink wash, as well as a golden colour in the central crown (compare the previous photos of Sulawesi Masked Owl with its grey central crown despite gold on the neck sides). This enigmatic owl is highly sought after by naturalists who visit Sulawesi, though rarely seen. Once in a while, the numerous guides at Tangkoko know of a roost site and lucky observers get to see it that way. For myself, and most visitors, however, this typically proves one of the toughest of the Sulawesi endemics to see. Fool that I be, I was visiting in the rainy season and no roost of any owls were reliable (not even the common species). 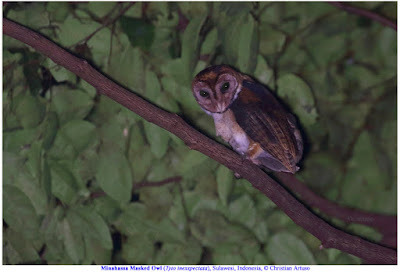 After three nights alone in the Tangkoko forest, with not so much as a peep, I finally heard a Minahssa Masked Owl near 4 am on my third night. The unmistakable, incredibly loud hiss came after I had been hiding out from the rain in a fallen, hollow tree and managed to get bites all over my legs from some unknown chigger-like creature. What followed was an intense 30 minutes of me trying to tip-toe through the rainforest, without using my headlight, towards the sound until the beast called a second time. At that point, I miraculously managed to find it perched in the subcanopy for a couple of precious minutes. The small size and heavily feathered, golden legs were obvious right away and, when that round, pinkish face, with golden crown, turned into view, all that discomfort and sleep deprivation were soon forgotten! Along with the Taliabu Masked Owl, this was the trip’s biggest highlight. Minahassa Masked-Owl (Tyto inexspectata), northern Sulawesi, Indonesia, © Christian Artuso (Note: I have used IOC spelling but the region name and the species name are spelled “Minahasa” by Birdlife International and others). 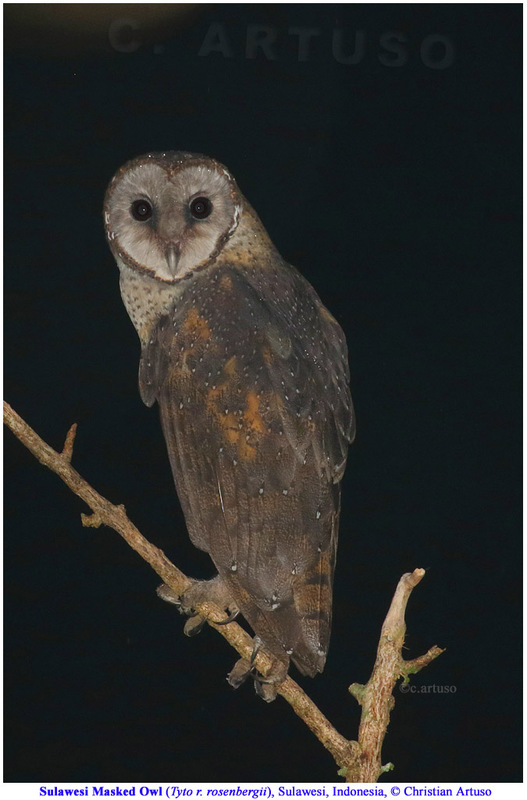 Since I did not manage to photograph the Taliabu Masked Owl, the only remaining Tyto to post about is the Eastern Grass-Owl, also known as the Australasian Grass-Owl. This species found from Australia, through New Guinea, Sulawesi, the Philippines and other islands, all the way to parts of China and India, though absent in many intervening areas. The name Australasian Grass Owl may seem odd; however, this owl seems more common in the Australasian parts of its range and I have always struggled to see it in Asia. This large and long-legged Tyto is a denizen of grasslands, vegetated wetlands, and other areas with tall grass or grass-like vegetation (this can include some cropland such as cane fields). 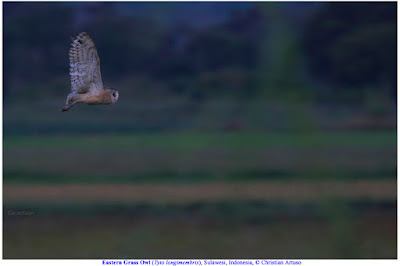 I thoroughly enjoyed watching this owl sail over the rice paddies of the Napu Valley in central Sulawesi at dusk. You can see how the toes project well beyond the tail, the long legs presumably a useful adaptation for a predominantly ground-dwelling species in grassy habitats. In that sense, the grass owls (Eastern Grass Owl and African Grass Owl) have something in common with the Burrowing Owl of the Americas, though they are much larger. This Eastern Grass Owl was too far away and the light too dim for good photos but, nonetheless, this was an especially sweet experience as I had not managed a photo of this species when I saw it in the Philippines. Eastern Grass Owl (Tyto longimembris), central Sulawesi, Indonesia, © Christian Artuso. From the barn owl family (Tytonida), we move to the typical owl family (Strigidae). The Otus owls are very common in Asia but as one moves east into the Australasian realm they decrease in diversity. There is typically only one species (often endemic) on the islands of “Wallacea” / eastern Indonesia. There are no Otus owls that regularly occur on mainland Australia or the main island of New Guinea, although one species is endemic to a small island off western New Guinea called Biak. 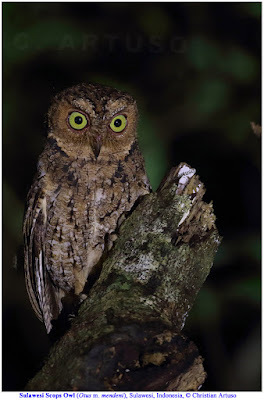 Sulawesi has its endemic Otus owl, not surprisingly called Sulawesi Scops Owl. Some of Sulawesi's satellite islands and the islands east of Sulawesi (the Moluccan Islands or Maluku) are also home to an Otus species. It is only fitting I start with the Sulawesi Scops Owl, which comes in two colour morphs (brown and rufous), this being a brown morph from the Tangkoko area. This species is quite common throughout the island of Sulawesi from sea level to at least 2500 m ASL. Sulawesi Scops-Owl (Otus manadensis), northern Sulawesi, Indonesia, © Christian Artuso. Although considered a full species by some taxonomists, the Banggai Scops Owl is listed as a subspecies of Sulawesi scops by the IOC. It is nonetheless smaller with a different call and other differences. It is IUCN red-listed as Vulnerable to extinction because the population is thought to be very small. If you accept it as a species then it is confined to one or two islands, Peleng Island and probably also Banggai Island. Peleng has suffered considerable habitat loss, which is part of the concern for this species. Banggai Scops-Owl (Otus [manadensis] mendeni), Peleng Island, Indonesia, © Christian Artuso. is not surprising. 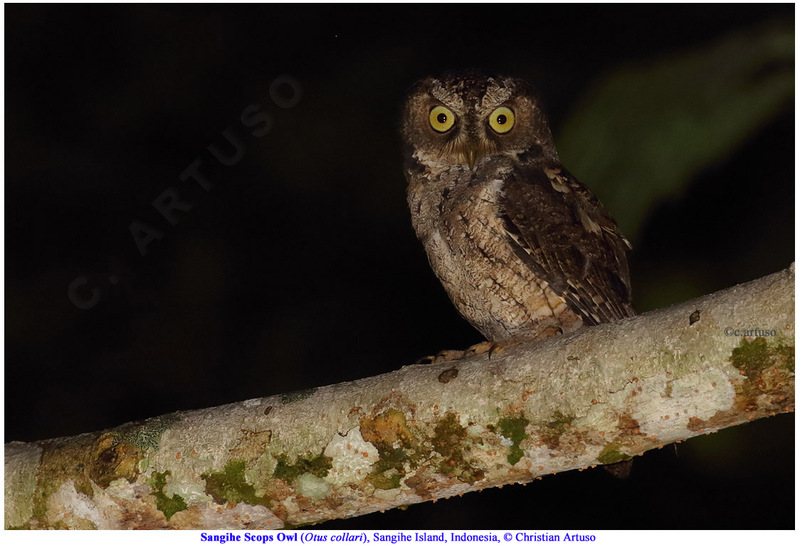 The Sangihe Scops Owl is also known by the name Sangir Scops, which is technically a better name since there is, or at least was, another Otus species in the Sangihe group on the island of Siau (possibly extinct). 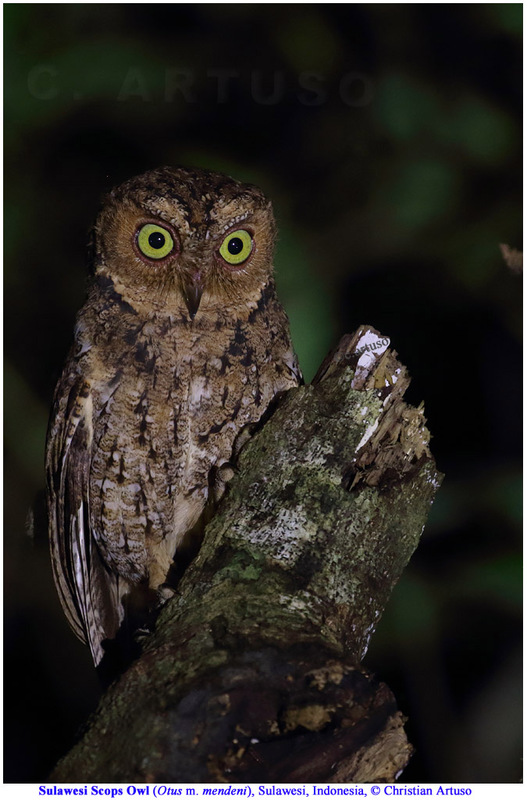 As the Sangihe Scops Owl seems able to use a variety of habitats including secondary growth and human-altered habitats, it is not on the brink of extinction like some of the other Sangir endemics. Sangihe Scops-Owl (Otus collari), Sangihe Island, Indonesia, © Christian Artuso. The Sula Scops Owl is a little bit of a mystery. 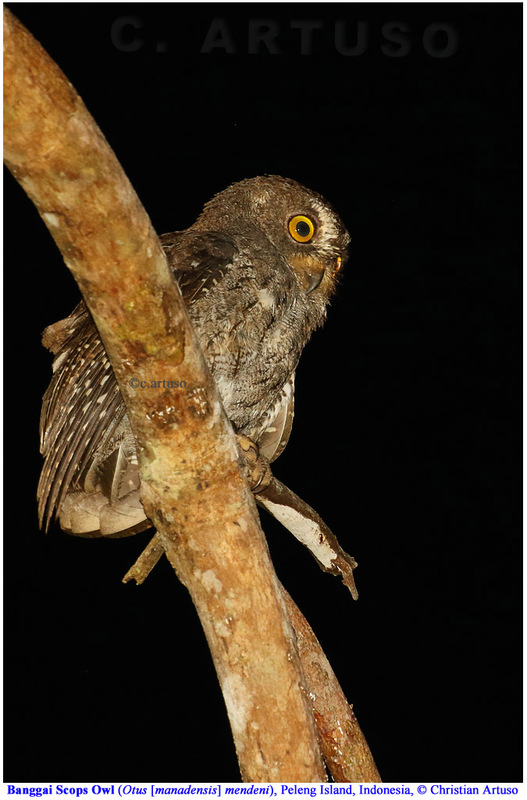 It is treated in some taxonomies as a subspecies of Sulawesi Scops Owl but it is strikingly different to that species in voice and morphology (several authors have suggested that it is probably most closely related to the Moluccan Scops Owl). Many taxonomies, including the IOC, now give it full species status. As the name suggests, it is endemic to the island group called the Sula Islands, being found on Taliabu, Seho, Mangole, and possibly also on Sulabes (my sources conflict on whether it occurs on Sulabes or not). The Sula Scops Owl is smaller than the Sulawesi Scops Owl with a deeper colour, smaller ear-tufts and other differences, especially the calls. This photo was taken near the village of Binadessa on the island of Taliabu. Sula Scops-Owl (Otus sulaensis), Taliabu Island, Indonesia, © Christian Artuso. 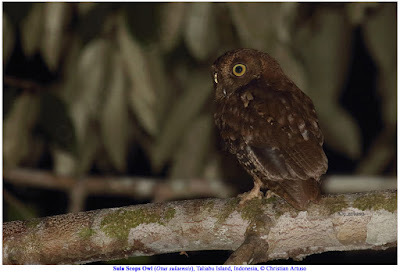 In addition to the Otus scops owls, the other important genus of owls on Sulawesi and its neighbouring small islands is Ninox. The owls of the genus Ninox are often called “boobooks”, an onomatopoeiac word describing the two-syllable call of the Southern Boobook, although many members of this genus have similar disyllabic calls. The Ninox genus owls also get referred to as “hawk owls” (in names as the Brown Hawk Owl Ninox scutulata), although they are not closely related to the Northern Hawk Owl (genus Surnia). Some Ninox owls do have a bit of a hawk-like appearance; especially the large ones with a weak facial disk (see my earlier posts on the Powerful Owl and the Barking Owl). The genus Ninox has a mostly Australasian and Southern Hemisphere distribution (a few reach Asia and the Northern Hemisphere) and is the only genus of typical owls (Strigidae) that occurs regularly in Australia. There are three Ninox species on Sulawesi (some would say possibly a fourth, which I will discuss later) and one on a satellite island. The Ochre-bellied Boobook is a Sulawesi endemic but it has a somewhat patchy distribution on the strangely shaped island. There are sightings on some of the small islands as well. It seems to prefer dense, moist forest types and because of its restricted range, seemingly small population, and somewhat narrow habitat requirements (making it vulnerable to logging), it is considered “Near Threatened”. Ochre-bellied Boobook (Ninox ochracea), northern Sulawesi, Indonesia, © Christian Artuso. 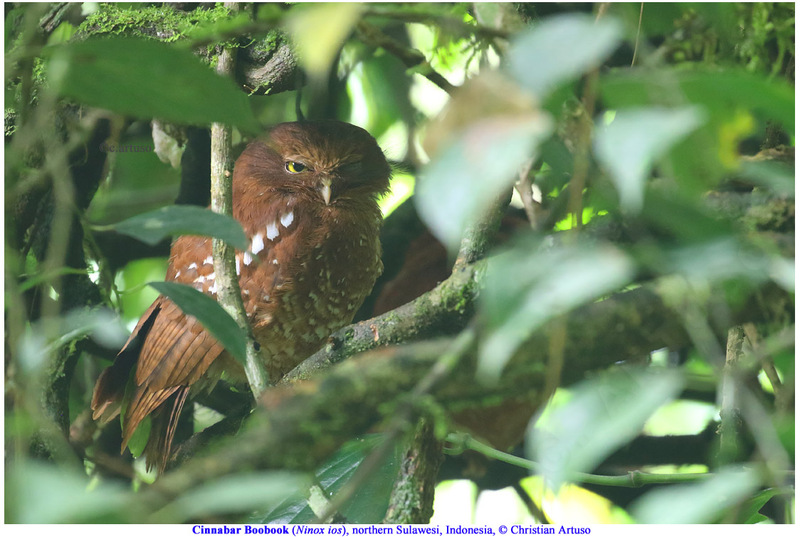 The Cinnabar Boobook is even more range restricted than the Ochre-bellied Boobook, occurring only above 1,000 m ASL and in isolated mountains on the northern peninsula (Minahas Peninsula) and then, maybe, in isolated mountains of central and southern Sulawesi. I say “maybe” because the undescribed taxon in central and southern Sulawesi has some mystery surrounding it, i.e. it remains unclear if it is a subspecies of Cinnabar Boobook or, some have argued, perhaps a separate species. I will post three photos northern Cinnabar Boobook below (from Gunong Ambang) and then one from central Sulawesi (Lore Lindu). The first photo shows a pair of Cinnabar Boobooks on a day roost (a very lucky find) and then two night photos are added (one showing the underparts). 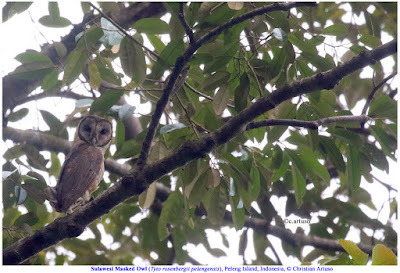 The most interesting thing about the four owls I saw at Gunong Ambang (two by day, two by night) was the very obvious white spots or scalloping on the underparts (when seen by day and by night). Most photos of the northern birds show limited white spotting on the underparts, certainly much less white spotting than this! In fact, the presence of white spots on the underparts is said to be one of the differences of the central Sulawesi birds, but my experience contradicted this. Due to its very restricted range and apparent rarity (it was only described to science in 1999), the Cinnabar Boobook is listed as globally Vulnerable to extinction. Cinnabar Boobook (Ninox ios), northern Sulawesi, Indonesia, © Christian Artuso. The undescribed Ninox owl of the highlands of central Sulawesi that looks and sounds very much like the Cinnabar Boobook is referred to as the “White-spotted Boobook” because the underparts are supposed to have more white than the northern peninsula birds. For this reason, I was especially keen to see this owl at Lore Lindu and when I did I was pleased to note the white-scalloped underparts as shown in this photo. I heard and saw this owl before I went to northern Sulawesi and thought little of it. 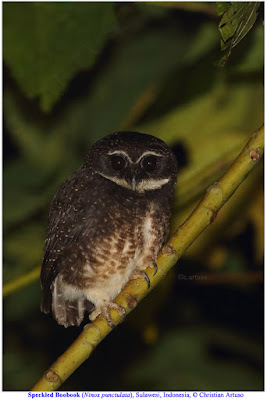 When I went to Gunong Ambang and heard the Cinnabar Boobook there, it sounded identical to my ears to the owls at Lore Lindu, both a gruff, soft tok-tok that seemed soft but was probably far carrying. Others have said that the call of these two is not quite the same but I could not discern any differences (maybe it needs a spectrogram). 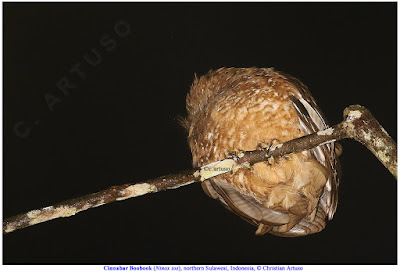 After I heard the Cinnabar Boobook at Gunong Ambang, I managed to see it. I was surprised that the boobooks here had more extensive white spotting than this bird from Lore Lindu. I don’t really have a good explanation for this other than individual variation. I was visiting Sulawesi in the rainy season when very few birders go, but a seasonal plumage change seems highly unlikely. Perhaps I saw aberrant individuals in both case but, if so, there was more than one of each. I did some online searching and found photos that show a range of plumage in northern Cinnabar Boobooks from almost unspotted to rather “scalloped”. This makes me think these owls are rather variable. I have read that the white-spotted form also has a more prominent white supercilium than the northern form but that did not seem to be the case (perhaps because they were so high in the canopy at Lore Lindu that I was unable to see the supercilium properly). Comments certainly welcome from those with more experience with these taxa…. The Speckled Boobook is an intriguing species, not least because of its hilarious, slow-building, maniacal call that is so different from the disyllabic call of most Ninox owls. Have a listen at https://www.xeno-canto.org/species/Ninox-punctulata for a good chuckle! 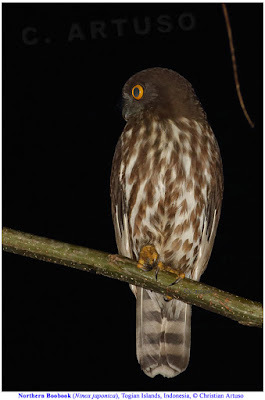 Speckled Boobook also seems to be the Ninox species with truly dark eyes. There is some variation in the eye colour of Speckled Boobooks, from dark brown to a lighter brown and some texts like Handbook of Birds of the World say even to orange-yellow (but none of the photos I have found show orange-yellow eyes). The White-browed Owl of Madagascar has dark eyes and used to be placed in the genus Ninox, but is now considered an Athene. 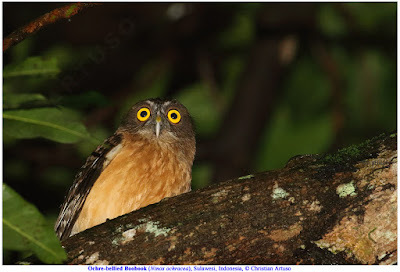 Brown eyes do also occur in some other species such as the Moluccan Boobook, but this may be age dependent, and the Russet Boobook has orange-brown eyes. 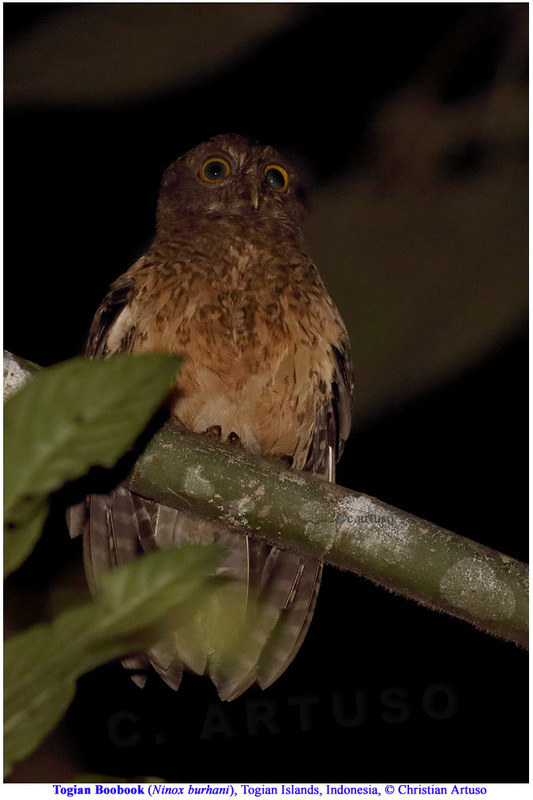 Some subspecies of widespread Ninox species may show variation in eye colour, e.g., some subspecies of Southern Boobook have somewhat brownish eyes, though most are yellow. In short, the Speckled Boobook may not be completely unique in this aspect but it is unusual. This is a widespread Sulawesi endemic, found on most of the island except high elevations. It seems to be able to utilise rather open forests and human-altered habitats more than the other endemic Ninox species of Sulawesi that I posted about previously and is not considered threatened. Speckled Boobook (Ninox punctulata), central Sulawesi, Indonesia, © Christian Artuso. The Togian Islands in the Gulf of Tomini (created by Sulawesi’s strange “armed” shape) have a few endemics of their own, despite their proximity to the main island. One of these is the Togian Boobook, a beautiful Ninox owl found on at least three islands in this group (Malenge, Togian and Batudaka), that was first described to science in 2004. The ferry schedule permitted me only one night on Batukada so I had to make the most of it. Fortunately for me, several of these owls were calling that night and they seemed to be in both the forested area and farmland edge. I still consider myself lucky to have spotted this individual at dusk. This species is considered Near-threatened, mostly because of its tiny global range and concern over ongoing deforestation in the islands (even if Batukada and Togian were made into a national park in 2004, there still seems to be a lot of clearing going on). 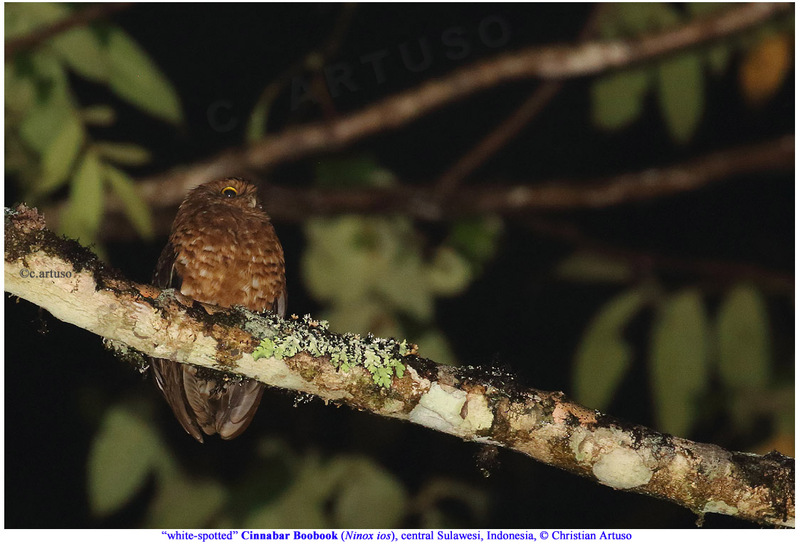 Togian Boobook (Ninox burhani), Batukada Island, Indonesia, © Christian Artuso. An unexpected bonus on my night hike on Batukada Island was spotting this perched Northern Boobook at the forest edge out of the corner of my eye. This bird was not calling, which is not surprising because this species is a winter visitor to this part of Indonesia, breeding in eastern Asia (eastern Russia, China, the Korean peninsula and Japan). As such, it is the northernmost member of its genus! 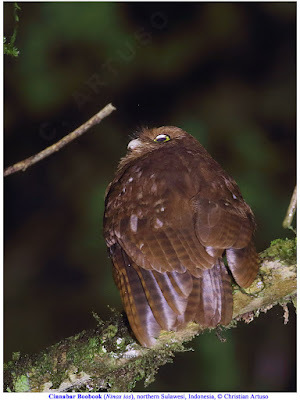 The Northern Boobook was only recently split from the extremely similar Brown Hawk Owl (or Brown Boobook). It is perhaps the only Ninox owl with a true migration, although the Tasmanian Boobook may also migrate north to mainland Australia (it is still not clear if this is a dispersal or a true migration). Northern Boobook (Ninox japonica), Batukada Island, Indonesia, © Christian Artuso. I hope you enjoyed this introduction to the owls of Sulawesi! I'm so glad I found your blog. Keep up the great work!